In 1996, the Illinois State Geologic Survey launched an ambitious program to map the entire state at the scale of 1:24,000 (1 inch on the map = 2,000 feet on the ground). This map scale is the most desirable for modern-day map applications, such as land use planning and resource assessment. As the Illinois mapping program progressed, ISGS mineral economists Subhash Bhagwat and Viju Ipe undertook a study to look at the actual economic value Kentucky's mapping program in order to gain insight into the potential value of detailed geologic mapping for the state of Illinois. Complete results appear in ISGS Special Report 3, Economic Benefits of Detailed Geologic Mapping to Kentucky. Highlights of that study are reported here. Between 1960 and 1978, the Kentucky Geological Survey, in cooperation with the U.S. Geological Survey, mapped the entire state of Kentucky at a scale of 1:24,000 for a total cost of about $90 million (1999 dollars). These printed maps—now in use for more than two decades—have generated enormous benefits to the economy, environmental well-being, and quality of life in Kentucky. However, until the ISGS study, no systematic determination of the long-term economic value of Kentucky's unique mapping program had been made. How are geologic maps used by various sectors of the economy? What map features are most desired by users? How do geologic maps contribute to the quality, credibility, and cost of projects? What is the dollar value of geologic maps to users? 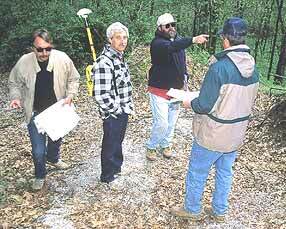 Global positioning systems (center) helps ISGS mapping team document terrain traveled on foot. Although the geologic maps were originally intended primarily to aid the development of oil, natural gas, coal, and minerals, respondents reported many new map uses that were unforeseen at the time of actual mapping. Groundwater exploration, for example, became a dominant map use. Uses for environmental, engineering, and land use planning have already become highly important and are likely to increase in importance in the future. Extremely valuable features for map users are lithology (the properties of geologic materials), structure (e.g., faults and folds), formation contacts, and manmade features (e.g., roads, houses, parks, nature preserves). Printed maps are currently used as overlays, copies, enlargements, and in geographic information systems (GIS). Digitized maps for computer manipulation by users are considered to be the prime need of the future. About 80 percent of users indicated that digitized maps of 1:24,000 scale or larger will be needed for future applications. Users cited dozens of specific examples of how the quality of their work was improved because of the information they obtained from the geologic maps. They also emphasized how poor planning and extra costs resulted when detailed geologic maps were not available for previous projects or in other states. Map users emphasized the credibility boost they received by being able to use maps prepared by unbiased and independent scientists of the geological surveys. What percentage of project costs, on average, would be spent gathering needed geologic information if maps were unavailable? Answer: About 17%. What is the minimum dollar amount that would be spent gathering information to complete their jobs and to satisfy the minimum credibility required in the market if maps were not available? Answer: $27,776 per quadrangle map. What estimated dollar amount was saved because detailed geologic maps were available? Answer: $43,527 per quadrangle map. What amount would users voluntarily pay for a geologic quadrangle map? Answer: about $342 per quadrangle map. Based on these user estimates and on map sale estimates by both the Kentucky Geological Survey and the U.S. Geological Survey, the value of geologic quadrangle maps of Kentucky was at least $2.25 billion and as much as $3.35 billion (in 1999 dollars), an amount 25 to 39 times the cost of the mapping program! User estimates of voluntary payment per map indicate that at least $27.7 million, or about one third of the cost of the mapping program, could have been recovered through map sales in just the 11 years for which sales data are available. Geologic quadrangle maps will find application throughout the state's economy in identifying water and mineral resources, protecting its environment, and improving the quality of life for its citizens. Geologic maps improve the quality and credibility of work done by consultants and local and regional land use planners who must optimize the use of water and mineral resources and minimize environmental degradation and hazards. The dollar value of geologic quadrangle maps could exceed the cost of mapping by at least 25 to 39 times. In addition to the considerable, tangible benefits highlighted in this report, detailed geologic mapping has intangible benefits such as increased credibility, time savings in project completion, and unbiased information prepared by scientists. These intangible benefits to the current citizens of Illinois and for future generations can often outweigh more easily measured benefits. To accelerate and improve the efficiency of its mapping program, the Illinois Survey is in partnership with the U.S. Geological Survey and the state surveys of Ohio, Michigan, and Indiana. This partnership, the Central Great Lakes Mapping Coalition, is setting regional standards for describing, sampling, characterizing, and interpreting surficial materials. The Coalition's pilot program, now underway in the Antioch Quadrangle in Lake County, will lay the groundwork for mapping high-priority areas of the state in a 14-year, intensive 1:24,000 scale mapping program. Although limited federal funds have been made available to the Coalition, the ISGS and other Coalition members are actively seeking the greatly increased funding needed to make this high-priority geologic mapping a reality.